US retail giant Target has begun testing Bluetooth Low Energy (BLE) beacons in 50 stores nationwide to send deals and recommendations on nearby products directly to a shopper’s smartphone running the retailer’s iOS mobile app. “When you’re located near one of the 50 test stores — in Chicago, Denver, Minneapolis, New York City, Pittsburgh, Portland, San Francisco and Seattle — you will be prompted to opt in to share your location and receive push notifications,” Target says. “We’re already working to develop additional features for future releases, including the ability to dynamically re-sort your shopping list as you move through the store, like how smartphone maps re-route when you veer off course,” the retailer adds. “We’re also planning to launch a service in the Target app where you can request the help of a store team member right from your phone. 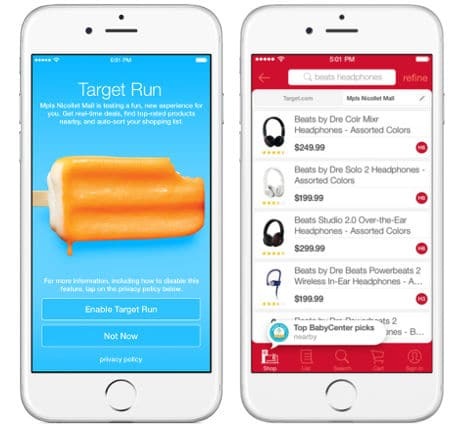 “We’re excited to start using beacon technology to offer real-time, relevant content and services that can help make shopping at Target easier and more fun,” says Jason Goldberger, president of Target.com and mobile. Target is a member of retailer-led consortium MCX, which is planning to launch its CurrentC mobile wallet in a “mid-sized” market this Summer following in-store tests this month. The retailer has also announced plans to support in-store Apple Pay payments. Good to see that Target is catching up. Carrefour has already installed 600 Bluetooth Low Energy (BLE) beacons in its 28 hypermarkets in Romania to guide shoppers around the stores and to deliver personalized promotions and offers either directly to their smartphones.